← A Grateful Family Recognizes Regency Park Nursing! Regency Gardens Nursing – March 2013 Activities! Regency Gardens Nursing and Rehabilitation is featuring an action packed month with activities galore for their residents and families! The Regency Gardens Recreation Director, Liz Johnson, puts her heart and soul into creating an impressive array of activities to excite all of the wonderful residents and families. It is small wonder, that Shoshana Stein, the Regency Gardens Admissions Director, has families clamoring to get involved in the activities! A personal favorite of mine (many of the residents agree), is the popular entertainer, Joey Sudyka! Joey always enthralls his audiences with his singular charisma and musical genius! 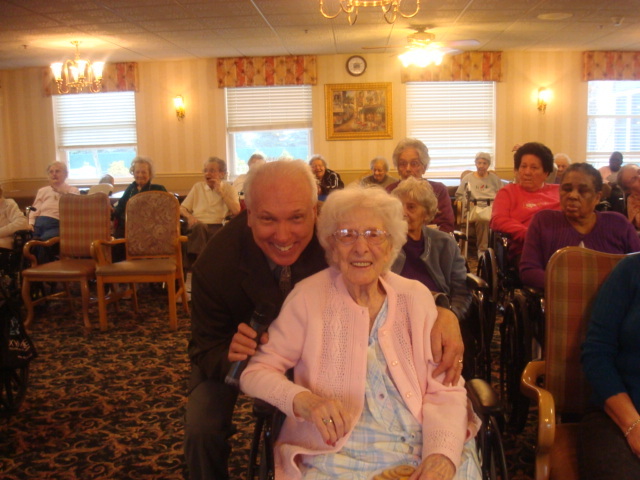 Here is joey with a (thrilled) Regency Gardens resident! Joey Sudyka with a thrilled resident! This entry was posted in HealthCare News, Regency Staff Spotlight, Tidbits and tagged joey sudyka entertainer, joey sudyka entertainment, joey sudyka musician, liz johnson regency gardens, regency gardens in wayne activities, shoshana stein, shoshana stein regency gardens. Bookmark the permalink.